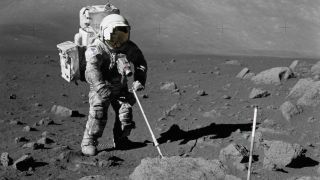 Geologist Harrison Schmitt walked on the moon during the last landing of astronauts during Apollo 17. THE WOODLANDS, Texas — NASA lacks the urgency needed to get back to the moon, according to one of the last astronauts to step foot on the moon and the only scientist to do so. During a plenary presentation at the 50th Lunar and Planetary Science Conference held here today (March 18), Apollo 17 astronaut and geologist Harrison Schmitt, who also sits on the users' advisory group of the National Space Council, was asked what's slowing down the push to return people to the moon. "I think what we're wrestling with is getting some sense of urgency into NASA," Schmitt said. "The president [Donald Trump] has given NASA a charter to get back to the moon. I think the president and the vice president [Mike Pence] feel there's a significant geopolitical urgency to do that, but we do not sense that NASA has that same sense of urgency." The charter Schmitt refers to is Trump's Space Policy Directive 1, which the president promulgated in December 2017 and which told NASA to set its sights on a return to the moon. That was a pivot from President Barack Obama's focus on sending astronauts to a near-Earth asteroid to prep for a trip to Mars, although the agency has framed revived lunar exploration by humans as a stepping-stone that will facilitate later Mars trips, which are logistically much more challenging. Currently, NASA's schedule calls for small lunar science payloads to touch down as soon as this year, followed by construction of a moon-orbiting space station called Gateway, which would not be continuously inhabited but which would support human lunar exploration. NASA is targeting a crew landing on the moon in 2028. That's a longer schedule than NASA was allotted with the Apollo program a half century ago, but NASA's budget is proportionally smaller than it was in those days, and the agency is striving for a heftier infrastructure that would facilitate a longer-term presence with each individual trip requiring less exertion than individual Apollo flights. NASA's modern moonshot also draws more energetically upon commercial partnerships, and that's where the moonwalker sees real progress happening so far. "Frankly, things [within NASA] don't seem to be moving very fast to get us back to the surface of the moon," Schmitt said. "Other than in the commercial sector — there's a lot going on there." Email Meghan Bartels at mbartels@space.com or follow her @meghanbartels. Follow us on Twitter @Spacedotcom and on Facebook.